Designed for comfort, style, and convenience, this drafting chair is an outstanding value. 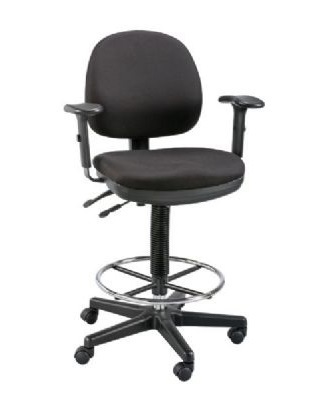 Features include pneumatic height control with an adjustment range from 23" to 33", padded armrests that are width and height adjustable with seven positions, a height- and depth-adjustable backrest with tilt-angle control, adjustable seat pitch, 18" diameter height-adjustable chrome foot ring, dual-wheel casters, and a 26" diameter steel reinforced nylon base. Waterfall seat cushion improves circulation and is 3½" thick x 19"w x 18"d. Back cushion is 3" thick x 17"w x 16"h. Both are made from ergonomically-contoured molded foam and include polypropylene back shells.